I have never heard of Ellora or Ajanta Caves and after seeing Agra, I haven’t expected Aurangabad to impress me, however, it turned out to be a pretty remarkable place, worthy of a detour from the “standard India package” destinations. Malik Ambar, the Prime Minister of Murtaza Nizam Shah of Ahmadnagar, made Aurangabad (at that time still a small village called Khadki, and later Fatehnagar) his capital city in 1610. Due to Ambar’s love and talent for architecture, it took only a decade for the village to become an imposing city. 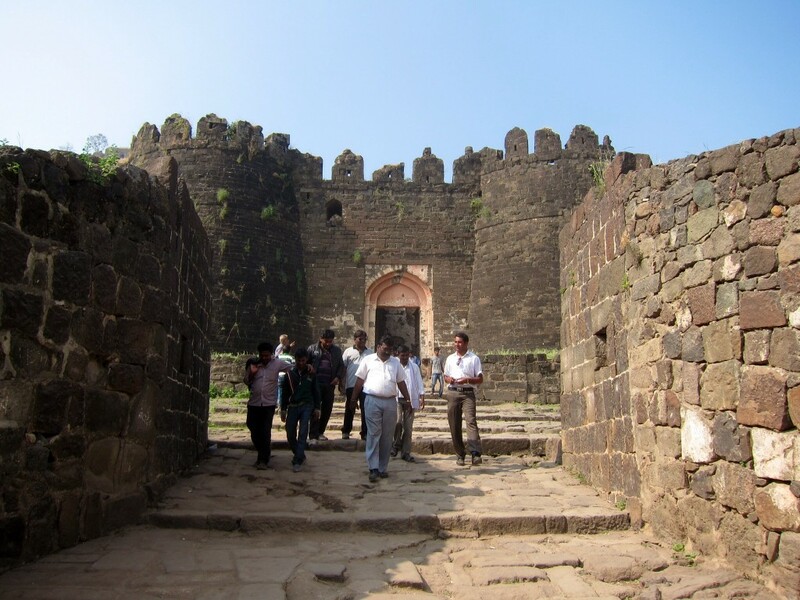 With the capture of the impregnable Daulatabad fort (i will talk about it later) by the Mughal troops in 1633, the city and all other Nizam Shahi dominions became a part of the Mughal empire. In 1653, when Shah Jahan’s son Aurangzeb was appointed the viceroy of the Deccan, he renamed the city after himself and made Aurangabad his capital. In 1756, one of Aurangzeb’s generals, Nizam-ul-Mulk Asif Jah, established in Aurangabad his dynasty and the city remained a part of his princely Hyderabad State until 1956. Aurangabad’s long and interesting history aren’t the city’s only attractions, it is also a hub to visit two World Heritage sites – Ellora and Ajanta caves, to admire The Small Taj Mahal aka Bibi qa Maqbara, to visit the impregnable fortress of Daulatabad and to pay respect to the last famous Mughal king – Aurangzeb, who is buried in Khuldabad. We didn’t wake up at Taj hotel in Aurangabad, as we planned, but in a small MTDC Ajanta Tourist Complex located just a few kms from the Ajanta Junction, 105 km northeast of Aurangabad. After checking-in at 5.30 am and getting a few hours of sleep, we had a breakfast/lunch and headed for the Junction to catch a bus for the caves. It is all very organized – first you get to the Ajanta Junction, then stay in line to catch a bus (Rs.15) to the Ajanta Caves’ entrance. The line at the bus stop happened to be about the longest I have ever seen in my life, so we paid “somebody” Rs.50 to get us on the bus “immediately”. Ten minutes later, we were already climbing the steps to enter the caves. Ajanta Caves are rightfully called the Louvre of ancient India; not only the caves themselves, but especially paintings and sculptures which represent “the finest surviving examples of Indian art”. The caves were cut into a side of a horseshoe-shaped cliff on a small river Waghora and their construction was done in two separate phases: from 2nd century B.C. – 1st century.D. and then, 300 years later – from 4th century A.D. – 7th century A.D. All the caves are purely Buddhistic monastic structures, representing a number of separate “monasteries” and teachings, and like most of the monasteries, they were divided into several distinctive caves for living and worshiping. Records from a Chinese scholar Xuanzang show that in 5th century, Ajanta was home for over several hundred teachers and students. All caves are numbered from 1-30 according to their location along the path, but not to their date of creation. Caves of the first period – 9,10, 12, 13 and 15A were built sometimes between 300 B.C. and 100 A.D., probably under the patronage of the Satavahana dynasty who ruled the region. At that time, Hinayana tradition of Buddhism was dominant (when Buddha was revered only symbolically) with great emphasis on Stupas (symbolical representation of Buddha) but not the Buddha’s statues (as in later periods). The caves were eventually abandoned, most probably because of the dominance of Hinduism in the region. 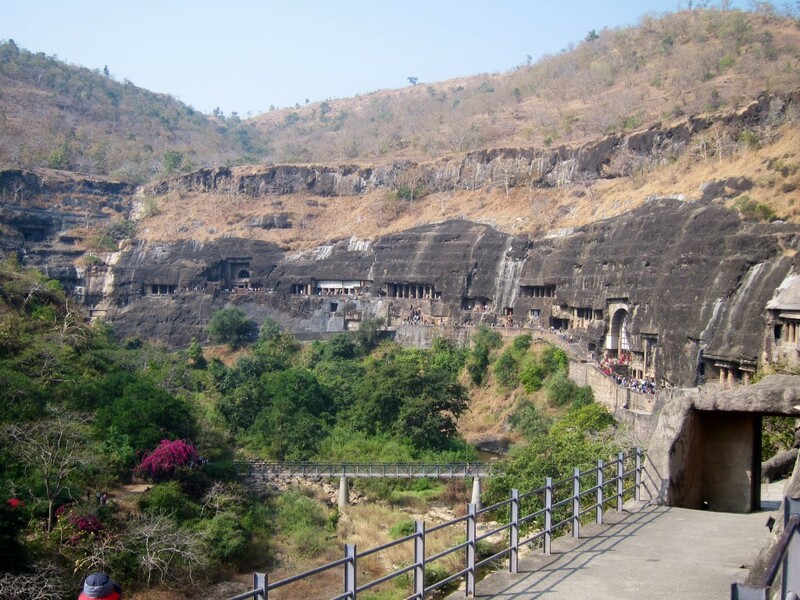 The second rise of Ajanta began in the 5th century. More than 20 caves were simultaneously created, for the most part in a form of viharas (hall for prayer and living, which are typically rectangular with small square dormitory cells cut into the walls) with a Buddha sanctuary in the back of the cave. The most elaborate caves were produced at that period, but it is a commonly accepted theory that some “old” caves were also re-done and extended. According to our guide, the construction of the second phase caves was “sponsored” by wealthy patrons but eventually, as more time passed, all those caves were gradually abandoned and forgotten. Just like the Temples of Khajuraho, they were hidden, unvisited and undisturbed till 28 April, 1819, when a British officer for the Madras Presidency, John Smith, accidentally discovered the entrance to cave 10 while hunting tiger. 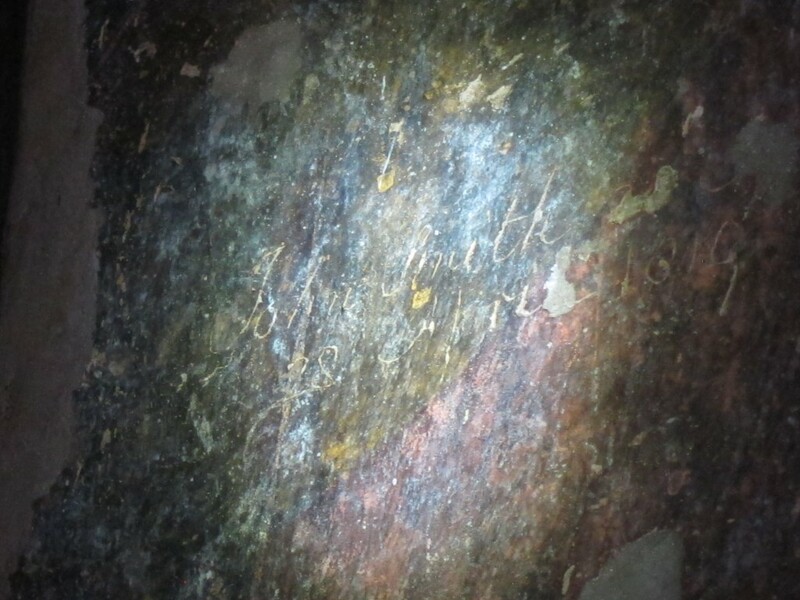 Captain Smith, as a true Brit, didn’t fail to scratch his name and the date – “April 1819” on the wall, thus vandalizing the cave. As I mentioned earlier, not only the structure of the caves was impressive, but also the murals and frescos, decorating the walls inside those caves. Some of them are large and very detailed, depicting the life of Buddha, and, as our guide Sunil pointed out, portraying all modern women’s hairstyles as well as the first lady-doctor. After paying an entrance fee (Rs.250) and hiring a guide (Rs.900), we proceeded to Cave 1. Even though, it is now the first cave that all visitors encounter, at the time when it was built, it was in the end of the row. It is believed that because all the best spots were already taken, the “new” cave wasn’t fully inaugurated for worship. Because of this, its interior was well -preserved (absence of sooty deposits from the butter lamps and lack of damage from the garland-hooks) and the most beautifully painted with murals depicting the most didactic, devotional and ornamental scenes from the Jataka stories of the Buddha’s former existences as a Bodhisattva. Adjacent to cave 1 is cave 2, which is in a better state of preservation that Cave 1 and also portrays the life of Buddha. You can slowly walk along the wall and “read” the narratives of the story of Jataka in pictures. Because many paintings in Cave 2 illustrate “noble and powerful” women in prominent roles, it is believed that the patron of the cave was an unknown woman. Cave 4 is considered to be “the largest monastery, planned on a grandiose scale but was never finished”. An inscription on the pedestal of the Buddha’s image mentions that it was a gift from a person called Mathura and belongs to 6th century A.D. Caves 9 and 10 are the beautiful chaitya halls (multi-storied entry with a cathedral-like hall) and belong to the first phase of construction. The paintings in the cave 10 include some from the first period, many from an incomplete re-painting in the second period and a large number of smaller late intrusive images, many with donor inscriptions from individuals. Cave 10 also contains the inscription from John Smith. 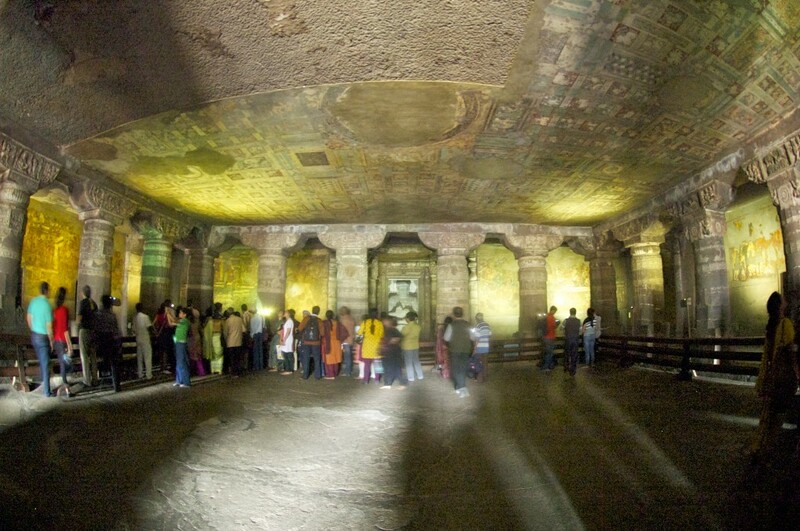 Cave 16, a vihara, is thought to have been the original entrance to the entire Ajanta complex of caves. It is considered to be the largest, finest and the most interesting monastery in Ajanta, famous for portraying the various episodes of Buddha’s life. 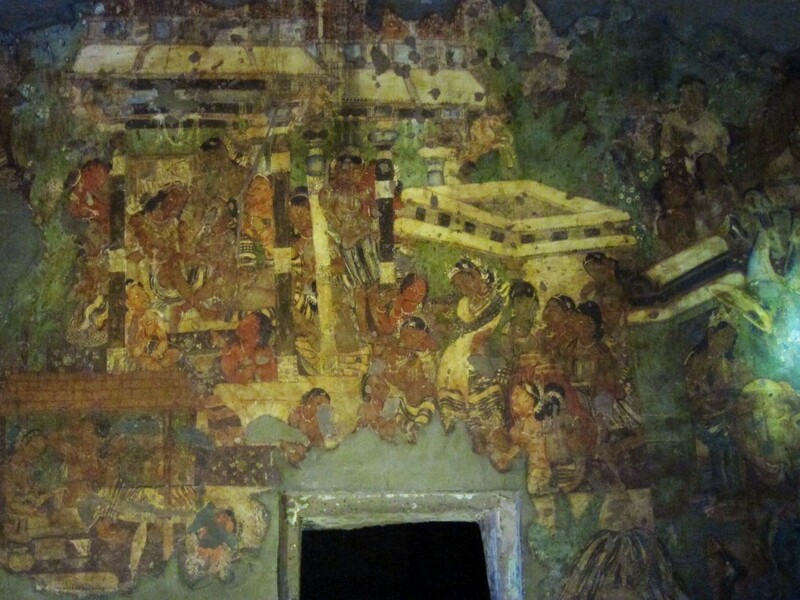 It is known for its painting of the dying princess – Sundari, wife of the Biddha’s half-brother Nanda, who is said to have fainted at the news that her husband renounced the material life and followed the Buddha. 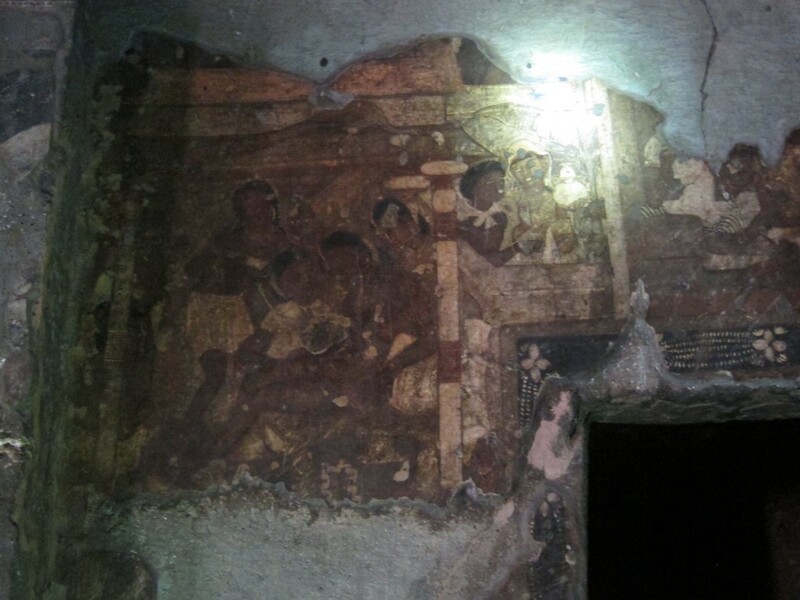 Cave 17 includes the famous images of a princess applying eye make-up, a prince seducing his lover with a help of wine and the Buddha returning home from his enlightenment. 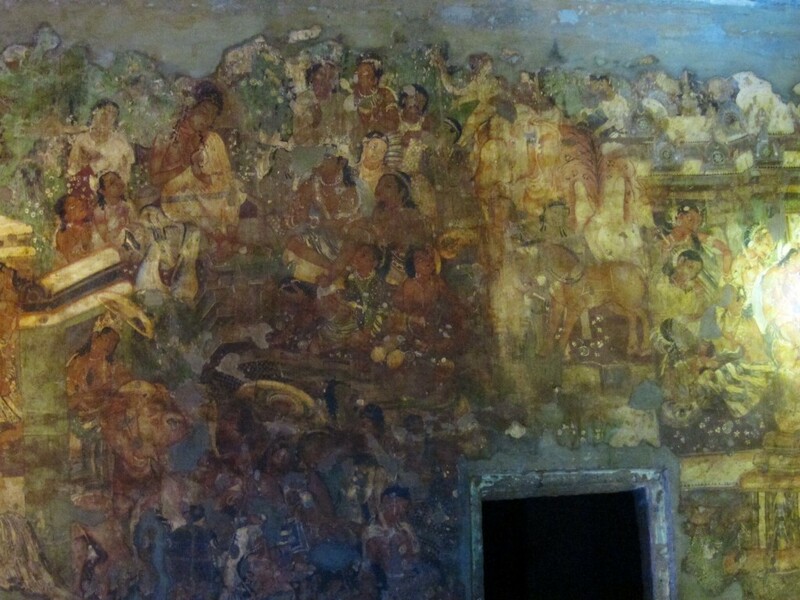 It also contains a detailed panel depicting the Prince Sinhala‘s expedition to Sri Lanka. Cave 19, perhaps my favorite, is a magnificent chaitya decorated with an amazing window entrance. Inside is a 3-tiers pedestal with the Buddha on the front. This cave is considered to be one of the most perfect examples of the Buddhist art in India. The richly decorated facade and impeccably detailed interior will make you fall in love with this cave. The inscription datable to 5th Century in Cave 17 records the a “feudatory prince under Vakataka King Harisena was a munificent donor of this cave”. 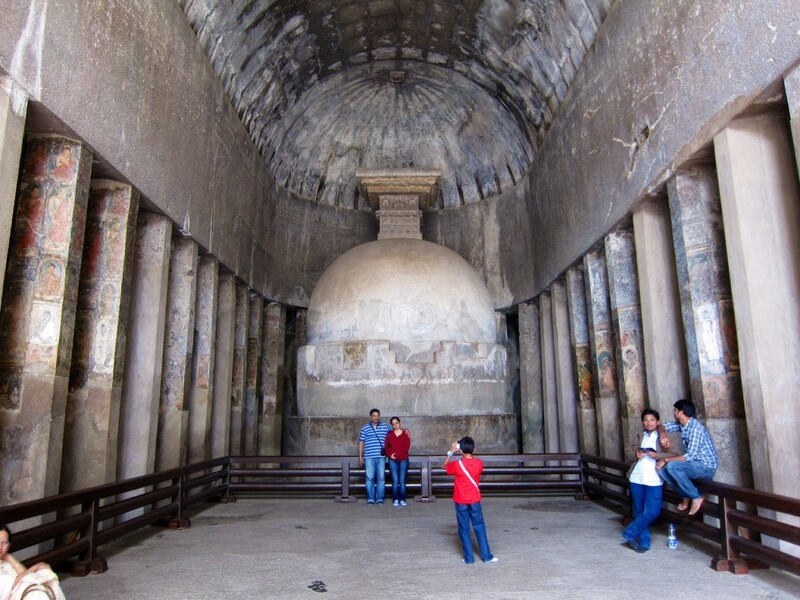 Cave 26 is one of the most impressive ones with a large reclining Buddha on the left wall. It also contains multiple attractive statues that should not be missed. 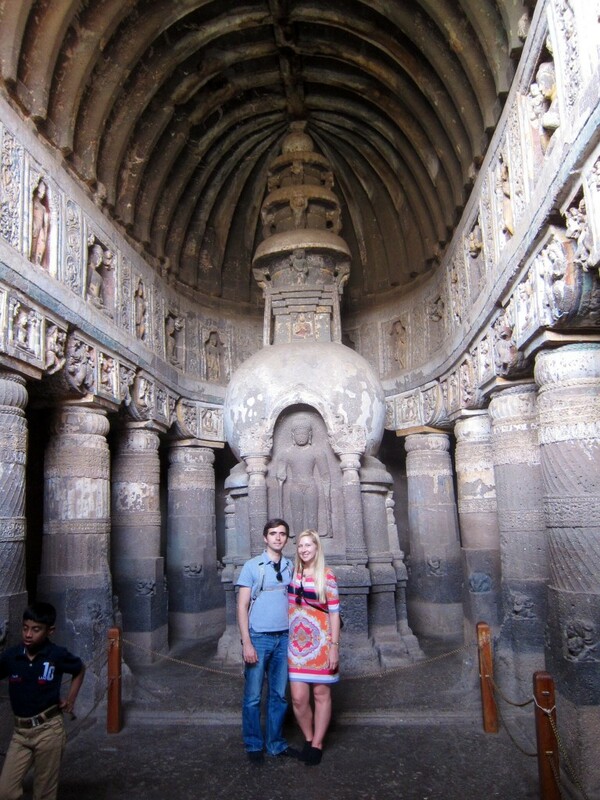 Those are the most memorable and remarkable caves, however, we did explore all 28 of them and with Sunil’s help, acquired quite a detailed and insightful knowledge of Ajanta caves. There are two viewpoints, apparently offering a picturesque view of the caves, but we didn’t get to any of them. If visiting, I do recommend hiring a guide (Sunil was exceptionally good), bringing a flashlight and remembering to turn your camera’s flash off. I have hired Ashok Kadam car service (e-mail: atkadam88@gmail.com and phone: 9890340816) from Aurangabad to drive us around for two days (Rs.3,600). So, when we finally left the caves around 4.30 pm, the car was always waiting to take us to the Vivanta by Taj in Aurangabad. 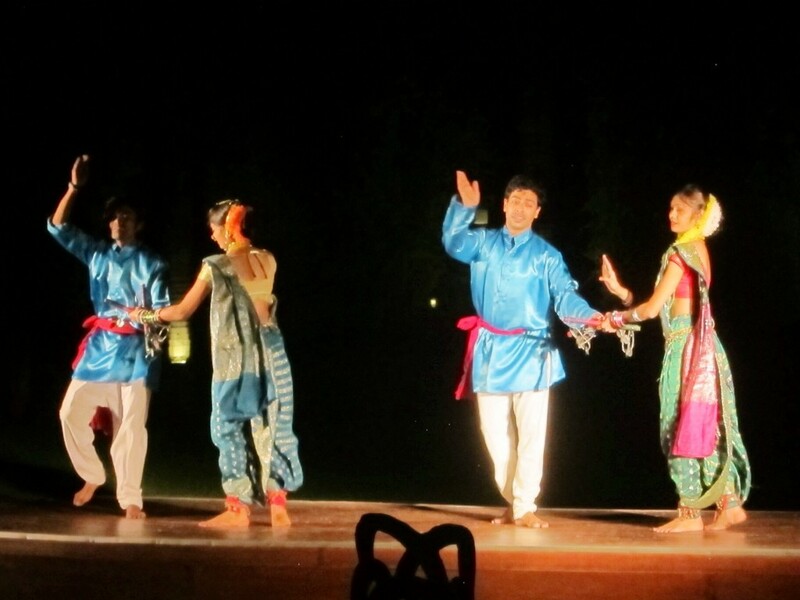 Two hours later, we were finally able to take a proper shower and have a Continental/ Indian buffet-dinner, accompanied by a traditional dance performance. 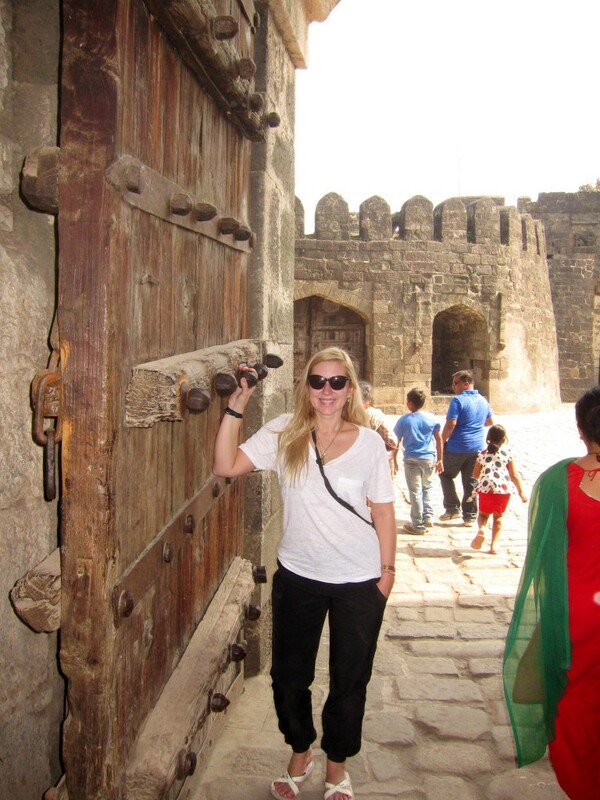 Aurangabad has many things to offer, and before catching a 4 pm flight to Mumbai, we had to visit quite a few places. 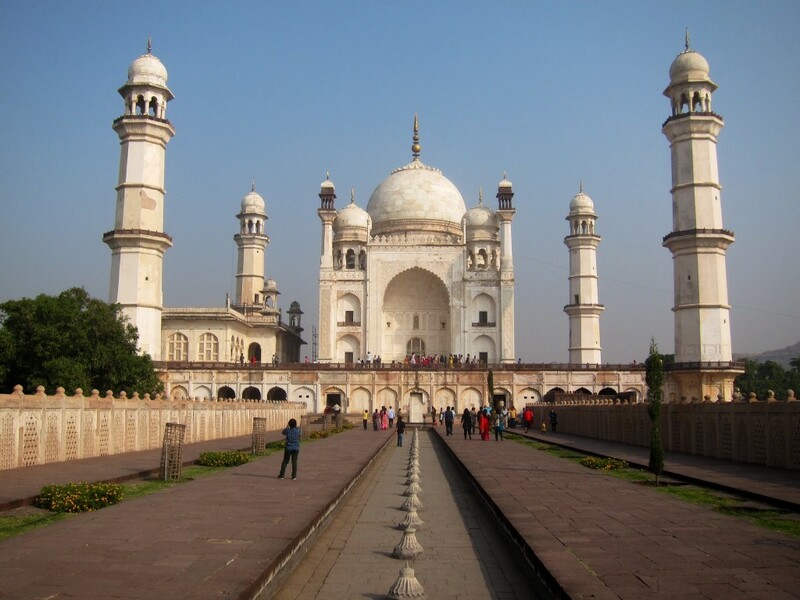 We started with Bibi-Ka-Maqbara (Tomb of the Lady), also known as Small Taj Mahal. It is believed to be built between 1651-1661 by Aurangzeb (or Aurangzeb’s son Azam Khan) in the memory of his first wife, Dilras Banu Begum (later known as Rabia-ud-Daurani). It was planned to be the Taj of the Deccan (and the white structure does bear a striking resemblance to Shah Jahan’s Taj), but due to severe budgetary constraints imposed by Aurangzeb , it was partially made of Jaipur marble and partially of lime mortar. Yet, it is a magnificent building. Like Taj Mahal, it is built in the middle of the garden broken into 4 sections, but unlike Taj Mahal, all sections of Bibi-qa-Maqbara were completed (Taj Mahal in Agra, as i mentioned in my Agra’s post, was only half-built, the other mausoleum, mirroring the Taj was supposed to be constructed out of the black marble on the other side of Yamuna river to host a body of Shah Jahan). The fountains in the middle of the walkway didn’t work, but provided a perfect picture spot. Unlike Taj Mahal, where the tombs of Mumtaz Mahal and Shah Jahan were placed on the ground level, the mortal remains of Rabia Daurani are located below the ground level surrounded by a marble screen with of an exquisite design. The roof of the chamber, corresponding the ground level of the mausoleum is pierced with an octagonal opening in the floor, providing a perfect observation point of the tomb below. 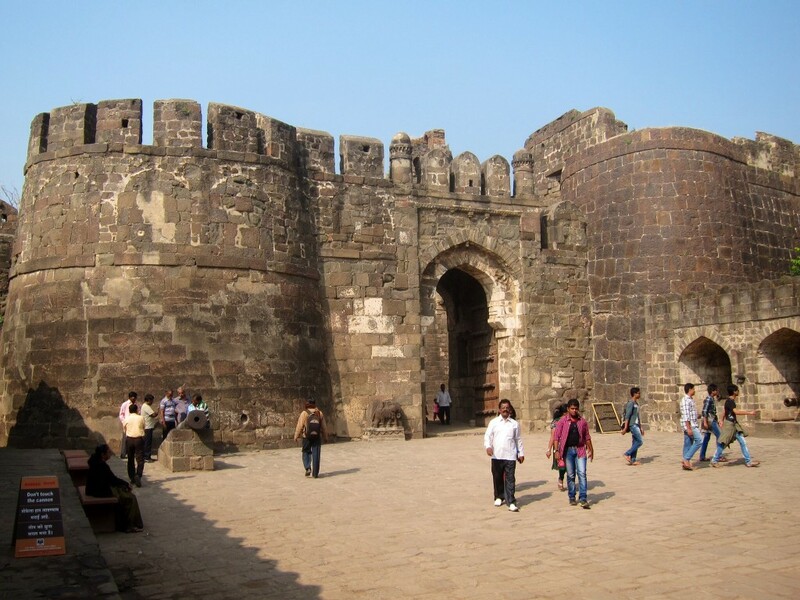 After spending about an hour at the Bibi-qa-Maqbara, we drove to Fort of Daulatabad. Built in 12th century by Yadava kings, this Fort represents something out of a fantasy world – it is beautiful, impregnable and beguiling. We hired an amazing older gentleman (Rs.900) whose name I shamefully forgot, who was perhaps, one of the best guides I have ever had, with a deep knowledge of the area and really fantastic storytelling skills. 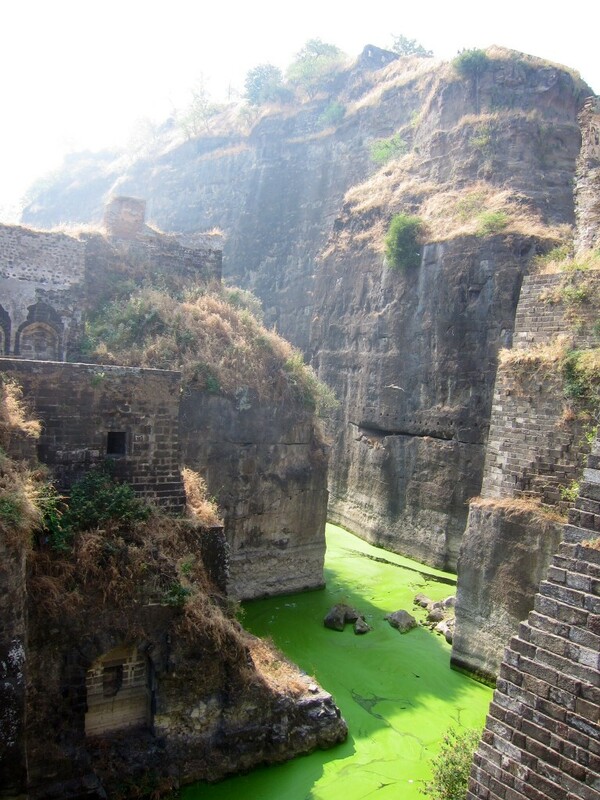 I wish, i had written down everything he told us about the fort and history of Daulatabad, so i could share it with you. The most famous historical moment associated with Daulatabad happened in 1328, when eccentric sultan from Delhi – Mohammed Tughlaq, made Daulatabad his capital and forced all people of Delhi to march 1,100 kms south to populate his new capital. Many people died en route, but those who survived and reached the city, later found out that there weren’t enough food and water to support them all, so 8 years later, Tughlaq forced the weary inhabitants all the way back to Delhi. Daulatabad Fort consists of two parts, both of them are fortresses but one is located at highpoint, requiring an hour climb up (we, unfortunately, had to skip that part, because we were running out of time). The lower citadel was not only the first bastion of defense, but also, according to our guide, a mental puzzle, full of deadly tricks to fight off the invaders. The front gate to the fort was equipped with long and sharp spikes in order to prevent an elephant charge on the door, but the space before the Gate wasn’t even big enough for an elephant to gain velocity, in order to break the door. The next trick was a very sharp right turn upon entering the gate, so in case the elephant succeeds in breaking the gate (by, apparently, using camels as a cushion between the elephant and the spikes), it would run straight into the Fort wall and kill itself. After breaking the first entry point, the invaders would face a choice of two routes from the gate, left and right. The right turn is the correct one, however, most Hindus would choose the left one, similar to the Hindu Temple prayer procedure (clock-wise), which would eventually lead them to the crocodile and snake infested water ditch. The right turn would take them to another gate, if they survive the uneven steps, made to distract the enemy and have them look under their feet and not above their heads from where the defenders would attack. If, eventually, they make it to the 3rd gate and break through it, it would again give them a choice of routes – a small (right) gate and a grande (wrong) gate. After succeeding in choosing the right one and managing to break the door, the invader would have to run one-by-one through a network of narrow alleyways, completely exposed to the city-protectors. I can go on and on describing dozens of other ways to protect the fort, just as our guide did. In the end, they would enter a pitch black, bat-infested, claustrophobia-provoking corridor, going all the way to the top of the mountain towards the second fort. The corridor had niches for the defenders and because their eyes would be adjusted to darkness, they would be in an advantageous position compare to the newly walked-in enemies, but even if that trick wouldn’t work, then upon letting the invaders into the corridors, the entrances would be shut down and poisonous gas would be released to gas them to death. The best part was that nobody ever got beyond the first gate, except for Shah Jahan in 1633. Besides the incredible tricks and traps, the fort also hosts a 60 m high victory tower – Chand Minar (Tower of the Moon); Chini Mahal, where Abul Hasan Tana Shah, kind of Golconda, was held captive for 12 years until his death in 1699; a canon, made of five different metals and engraved with Aurangzeb’s name; a huge water reservoir and a temple, that originally was Jain, then Muslim mosque and then Hindu temple, currently, it is a mixture of all three and worshippers of all those religions come to pray in the same place. Due to the holiday period, the fort was very crowded with school students and one minor but funny accident happened to us. While we were walking and listening to our guide, a group of schoolgirls entered the gate and, i guess, they were so fascinated by us that the entire group, perhaps 30 people, diverted from from their course, left their teacher and started following us, in a very organized, holding-hands, manner – 2 people in a row. 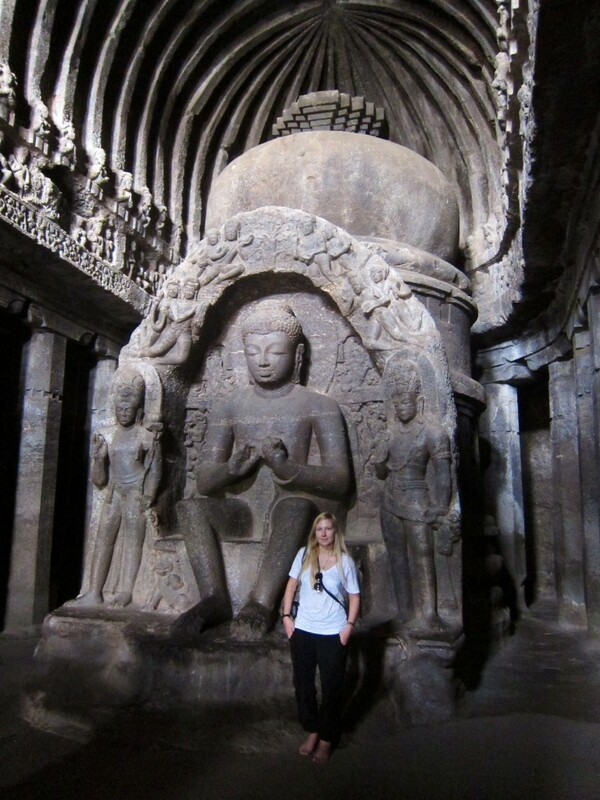 We really wished we had more time to explore that incredible fort, but we had to go on with our original plan to see the World Heritage -listed Ellora Caves. 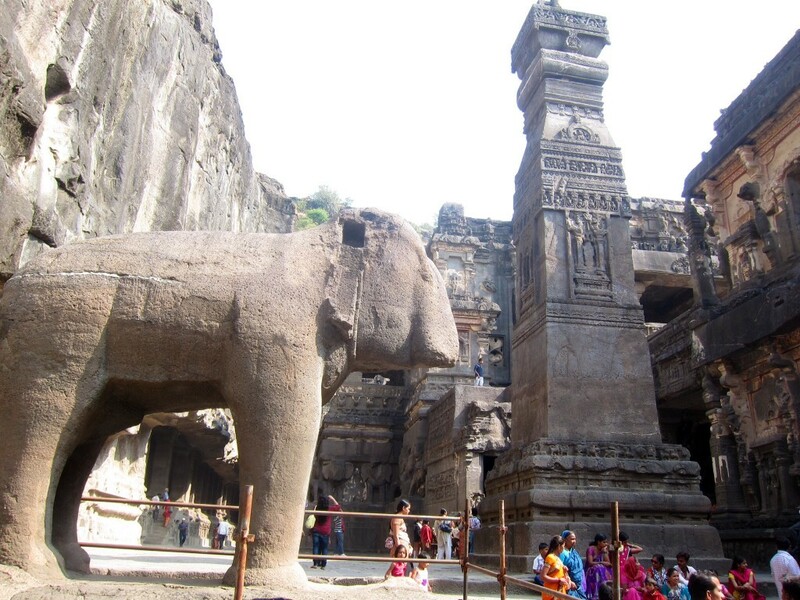 Ellora is an archeological site and the pinnacle of ancient Indian rock-cut architecture. 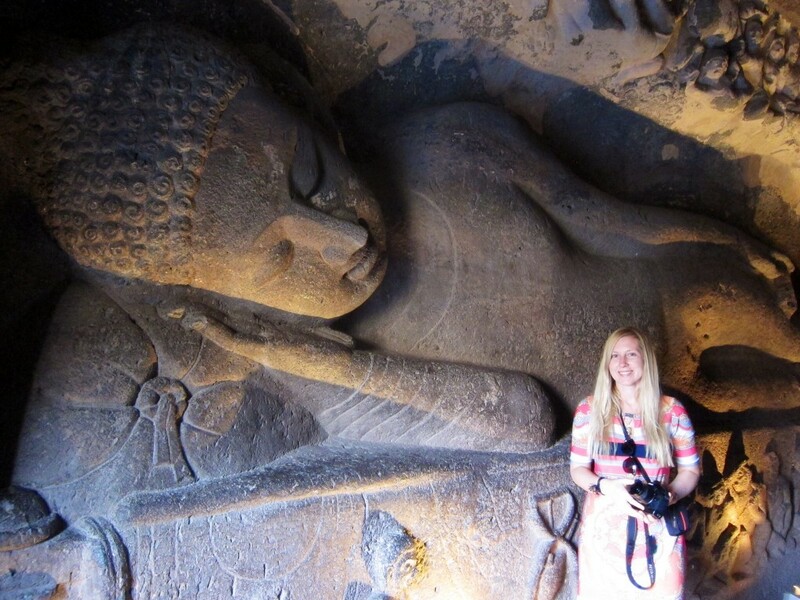 The 34 caves belong to Buddhist (caves 1-12; 600-800 A.D.), Jain (caves 30-34; 800-1000 A.D.) and Hindu (caves 13-29; 600-900 A.D.) religions and were carved out sometime between 5th and 10th centuries. 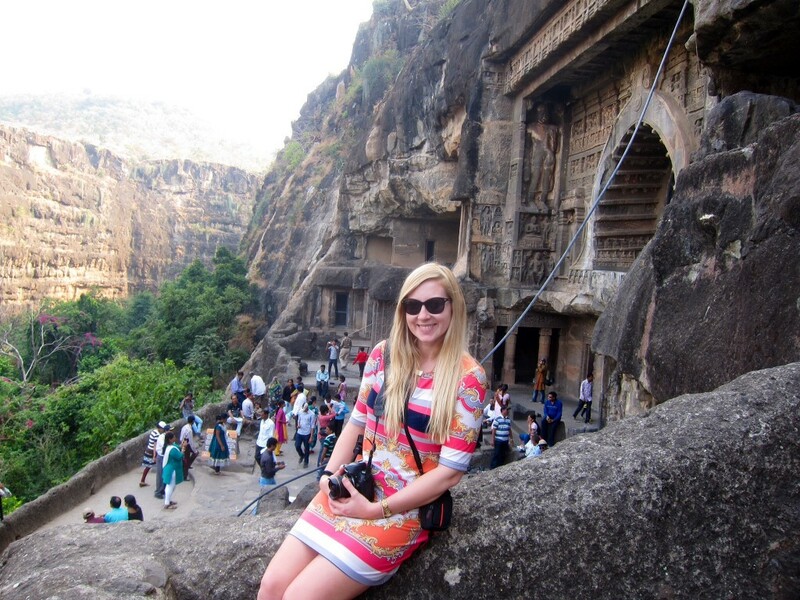 Every cave, just like in Ajanta, served its purpose – some of them were monasteries, some were chapels or temples. But unlike Caves of Ajanta, which are carved into a rock face, the Ellora caves line a 2 km-long vertical slope, which allowed architects to build more elaborately reaching the supreme quality of structures. Historically, coexistence of Hinduism, Buddhism and Jainism in one place represents a lengthy period of religious tolerance. 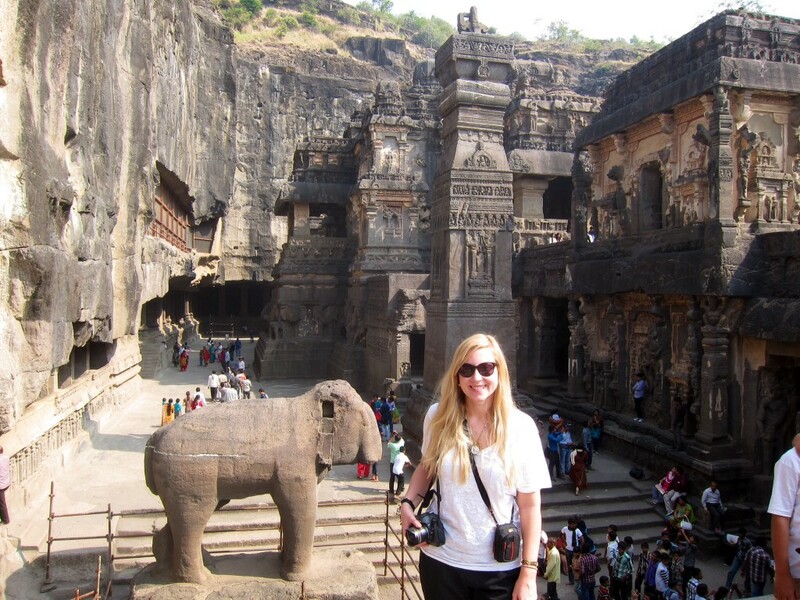 The first cave you encounter is the unrivaled centerpiece of Ellora- Cave 16, also known as Kailasa Temple (Kailasanatha). The world’s largest monolithic structure (twice as large as the Parthenon in Athens) was chiseled out of a single rock, from top to bottom with no margin for mistake by 7,000 laborers over a 100-year period. The project was started by Krishna I (757-773) of the Rashtrakuta dynasty that ruled from Manyakheta (present day Karnataka state), thus the temple was built in a prevailing South Indian style. The temple was designed to recall mount Kailash in Tibet (which reminds me of a great 3 day kora , I took around Kailash in 2010), the abode of Lord Shiva. Initially, Kailasa was covered with white plaster, giving the temple a “snowy” look of a mountain. A two-storeyed getaway opens up to reveal a U-shaped courtyard, that is edged by columned galleries three stories high. The galleries contain huge sculpted panels and enormous sculptures of a variety of deities. Within the courtyard are three structures, the first is a large image of the Shiva‘s sacred bull Nandi, the second, standing on 16 pillars and rising 29.3 m high, is the Mandapa housing lingam and the third is Shiva Temple, connected from Mandapa by a stone bridge. The temple is a tall pyramidical structure of a South Indian style; it is completed with a shrine with pillars, windows, inner and outer rooms, gathering halls and an enormous lingam carved out of a stone. 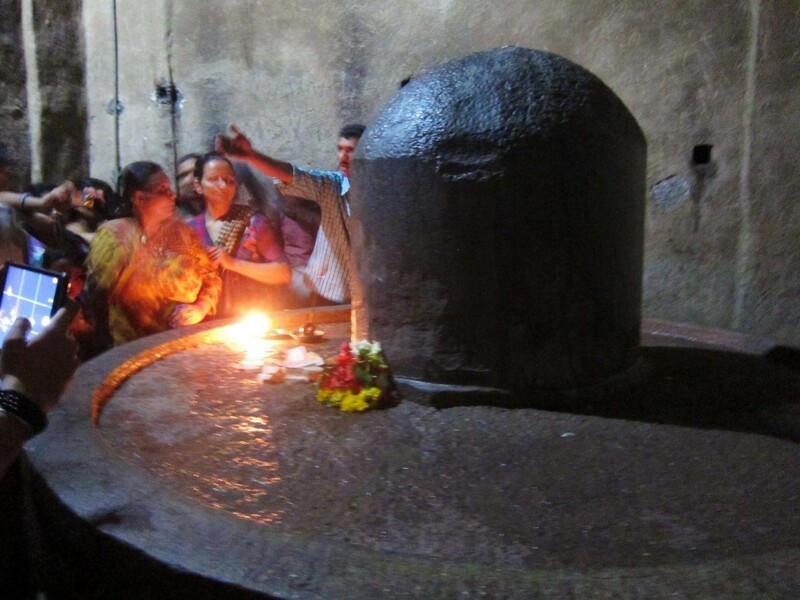 The temple is still in use, so we entered to pay our respect to Lord Shiva. 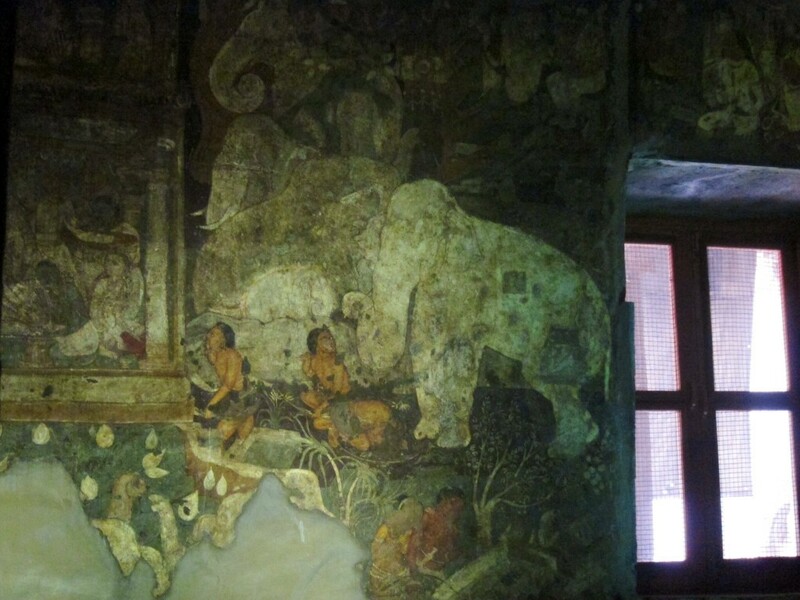 The panels around the Cave depict the scenes from the Ramayana, the Mahabharata and the adventures of Krishna. You don’t have to be an architect or an engineer to appreciate Kailasa Temple, it will take your breath away the moment you cross the entrance gate. Sadly, we didn’t have too much time to walk around and enjoy this marvel. 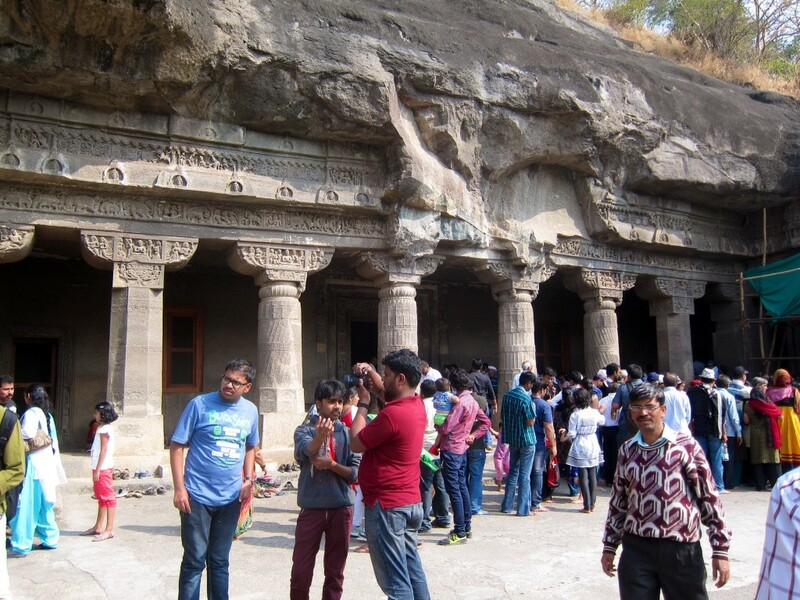 Due to time constraints, after seeing a Hindu Temple of Kailas, we ran over to check out a Buddhist cave 10 and took a tuk-tuk to see Jain caves 30-34. Almost all Buddhist caves are built as viharas (monasteries – large, multi-leveled buildings including living and sleeping quarters, kitchens and other rooms), except Vishvakarma cave 10 , which is a chaitya (assembly hall) and is popularly known as the “Carpenter’s cave”. Resembling, by its structure, caves 19 and 26 in Ajanta, this cave, built in 700 A.D., is one of the finest in India. The front is a rock-cut court with pillared porticoes housing the chambers in their back walls. The main hall is divided into a central nave and side aisles by 28 octagonal columns with a colossal 3.3 m high seated Buddha in a teaching posture. The balcony and upper gallery offer a beautiful view of carved amorous couples. Ellora’s Jain temples aren’t as grandiose or artistic as Hindu temples (reflecting a strict sense of asceticism associated with Jain philosophy), however, they are extremely detailed in their execution. 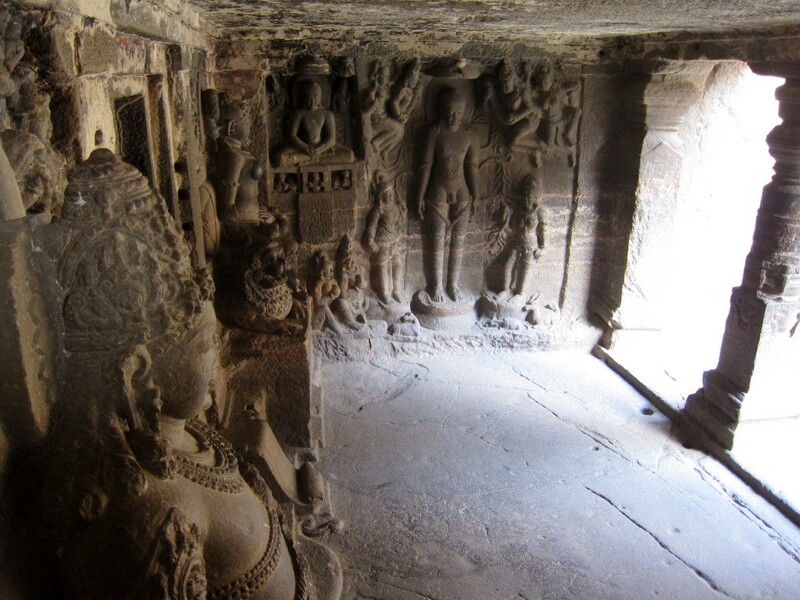 All 5 caves belong to 9-10 centuries and represent Digambara sect of Jainism. Cave 30 is a Chhota Kailas (Little Kailash), Cave 32 Indra Sabha (Assembly Hall of Indra), the finest of all Jain Temples, is a two-leveled cave with a monolithic shrine in its courtyard. It was named Indra Sabha perhaps because of the exquisite ornamentation and carvings, but also because of the sculpture of the yaksha (dedicated attendant deity) Matanga on an elephant, which was wrongly identified as that of Indra. We left the caves in a hurry, because we had another stop to make – at the tomb of Shah Jahan’s son Aurangzeb in Khuldabad – a small pilgrimage village just a few kms away from Ellora Caves. It is an important religious center due to its abode to two of the most revered Muslim’s Sufis namely, Burhan-ud-din Gharib Chisti and Zain-ud-din Shirazi and also location of tombs of Aurangzeb and his son Azam Shah and his wife. Aurangzeb’s tomb is in the south-east corner of the courtyard of Alamgir Dargah and it is remarkably simple, according to his own wishes. Despite matching the legendary King Solomon in terms of riches, Aurangzeb was an ascetic in his personal life and insisted to be buried in a simple tomb in an open air grave in accordance with his Islamic principles. 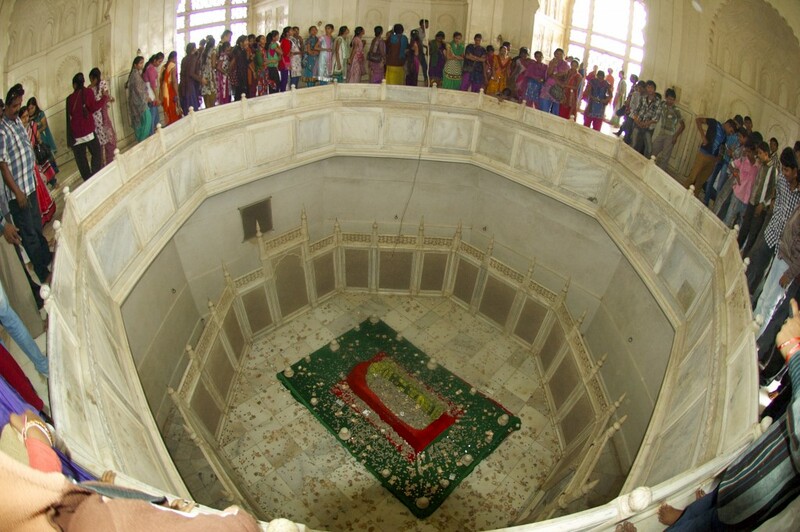 Aurangzeb himself funded his resting place by knitting Muslim skullcaps and copying the Qu’ran, during the last years of his life, works which he sold anonymously in the market. Initially, his tomb was not mark at all, but at the request of Lord Curzon (then Viceroy of India) who visited the tomb in 1911 and was shocked by the simplicity of the grave, the neat railing of perforated marble was erected by Nizam. 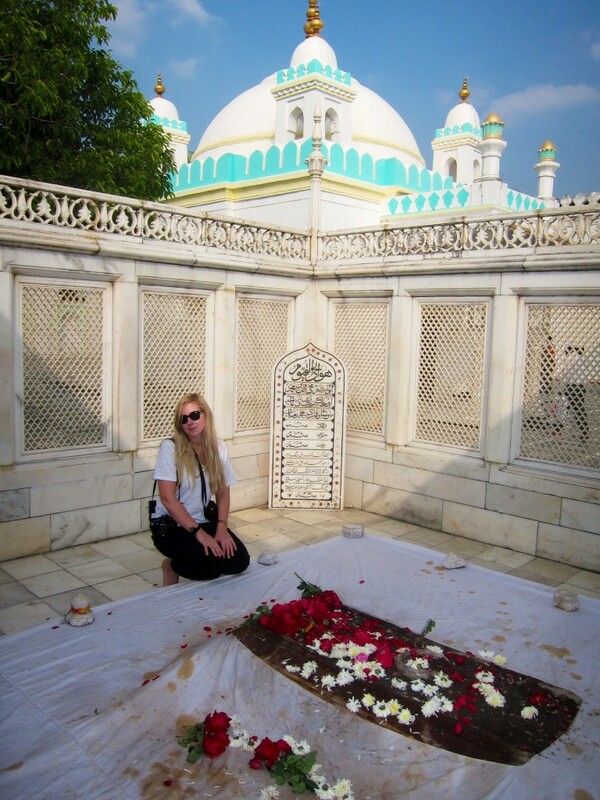 In the middle of Dargah is the mausoleum of Sayyed Burhan-ud-Din, a Sufi saint. Burhan-ud Din studied with Nizamuddin Auliya, the sultan-ul-mashaikh if Delhi and was granted with the cap and the mantle, the symbols of Caliphate. He came to Daulatabad along with Sultan Muhammad Tughulq (when he moved the entire Delhi to his new capital), stayed and died there in 1344 A.D. Within the shrine are preserved, or so they claim, some hair of the Prophet’s beard and in a shrine next to it – clothes worn by Prophet. 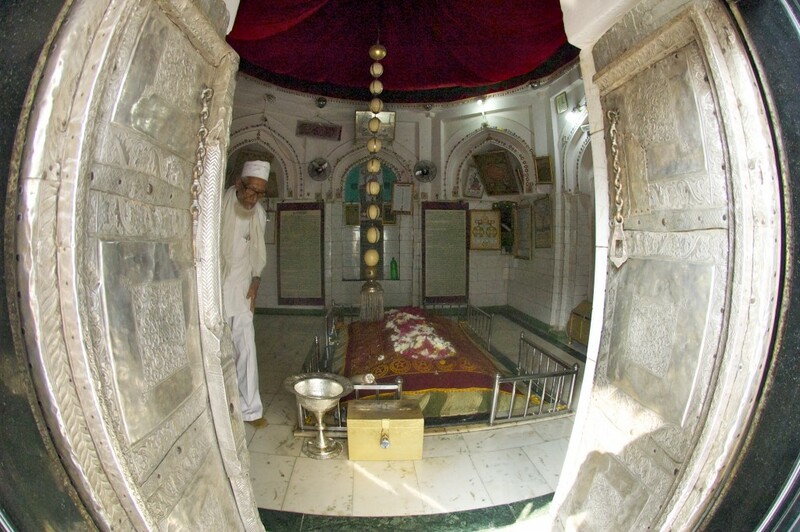 A small enclosure opposite to Aurangzeb’s tomb, is a final resting place for Aurangzeb second son – Azam Shah and his wife, close by is another grave – said to be that of a daughter of a Muhammedan saint. Azam Shah’s grave has a small marble headstone ornamented with carved floral design. After paying our respect to the last greatest Mughal emperor, we were rushed to the airport to catch a flight to Mumbai. However, a small accident happened between us and our driver. After visiting Bibi-qa-Maqbara in the morning, I caught our driver looking through my Lonely Planet book that we left in a car. When we got back into a car, I asked him to pass me my book which he placed on the passenger seat next to him. When I saw a book, its front page was torn in the middle, so I confronted the driver and instead of admitting, he bluntly told me that he hasn’t touched anything and hasn’t seen the book at all. Unfortunately, it is a common trend among locals to lie; we encounter it everyday and in every place. Nevertheless, thank to our amazing guides and beautiful sights to see, I really liked Aurangabad! This entry was posted in Asia and tagged Abul Hasan Qutb Shah, Ajanta Caves, Alamgir Dargah, Aurangabad, Aurangzeb, Aurangzeb's Tomb, Azam Khan, Azam Shah, Bibi Ka Maqbara, Bibi-qa-Maqbara, Buddhism, Burhanuddin Gharib Chisti, chaitya, Chand Minar, Chini Mahal, Daulatabad, Digambara, Dilras Banu Begum, Ellora Caves, Fort of Daulatabad, George Curzon, Hinayana, Hinduism, Indian lies, Jainism, jakata tales, Kailash Temple, Kailashnath, Khajuraho, Khuldabad, Krishna I, Lord Curzon, Lord Shiva, Mahabharata, Malik Ambar, Mohammad bin Tughluq, mount Kailash, MTDC Ajanta T Junction, Nandi, Prince Sinhala, Prince Vijaya, Prophet Muhammad, Qamar ud din Khan, Ramayana, Satavahana Dynasty, Shah Jahan, Shiva, stupa, vihara, Vivanta by Taj, Xuanzang, Zainuddin Shirazi. Bookmark the permalink. ← Khajuraho to Aurangabad, India. December 2013.